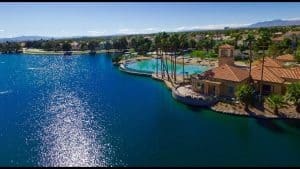 Desert Shores is a highly sought after community due to its unique lifestyle offerings that include four man-made lakes, a beach entrance lagoon style swimming pool, BBQ pits, private docks, paddle boating, fishing and tons of play areas. All of these great amenities come at an affordable price and in a great Northwest area location at the base of Summerlin and quick access to major freeways. Your weekend can be full of fun and memorable activities for all members of your household. This residential community encompasses 682 acres and building began by RA Homes in 1988. Majority of the 3,300 residences in Desert Shores were build by 1992. Some communities in the neighborhood are gated or guard gated so there and many choices in regards to home prices but generally start around $250,000 for a small starter home. Take a drive through this great neighborhood and you will see just why many people have decided to make the Desert Shores master-planned community their home. Be sure to see the amenities at the private pool area that is included for all owners and the 2,100 sq ft clubhouse available to all members for their private events. Desert Shores is located in the 89128 zip code.